EDITOR'S NOTE, 1/15/2019: Since this blog post was published, the Malawi government has revised the Malawi Youth Forest Restoration Program. Now, $2 million will support youth in restoring more than 50,000 hectares of land, instead of $7 million to restore 125,000 hectares. This is still equivalent to 1.5 percent of the annual budget, and the government remains deeply committed to investing in natural resource management within the country. We have changed the text below to reflect the new budget numbers. Nearly all – 96 percent – of Malawi’s rapidly growing population depends on wood or charcoal for cooking. Meanwhile, land is continuously being cleared to grow crops, since nearly 80 percent of Malawians rely on agriculture for their livelihoods. As in other countries in sub-Saharan Africa, these two factors put pressure on forests, increasing climate-warming emissions, disrupting watersheds and reducing biodiversity. Malawi’s government is determined to combat this potentially disastrous trend by investing in long-term solutions for natural resource management, and has recently announced a USD $2 million (1.43 billion Malawian kwacha) program for forest restoration. For an emerging economy like Malawi, this is a huge investment equivalent to about 1.5 percent of the government’s annual spending. Malawi’s Ministry of Natural Resources, Energy and Mining will use this substantial funding to implement the Malawi Youth Forest Restoration Program, recognizing that a sustainable future lies in the hands of the country’s youth, who need a bold demonstration of the value of forests. Under the new initiative, the Department of Forestry will work with the Ministry of Labour, Youth and Manpower Development to set up youth groups across the country. The young people will receive a daily wage for planting trees and, later on, the program will introduce bonuses based on how many trees survive and how much forest management improves. 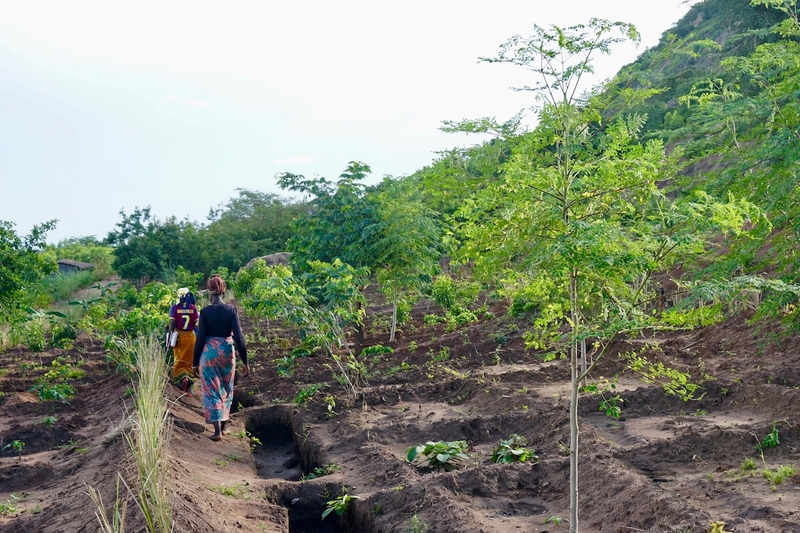 This type of domestic support to restore degraded land in Malawi is groundbreaking, even among a network of African countries that have shown tremendous commitment to restoration through the AFR100 initiative. To date, as part of this initiative, 27 countries including Malawi have collectively pledged to restore 111 million hectares (274 million acres) of degraded and deforested land across Africa by 2030. Malawi has pledged to restore 4.5 million hectares (11 million acres), more than one-third of the country’s land area. As a result, last year, Malawi’s government launched a first-of-its-kind National Forest Landscape Restoration Strategy, which provides clear targets and priority interventions for increasing forest cover as a means of achieving critical development goals. To measure the impact made by the Youth Forest Restoration Program and similar initiatives, Malawi recently became the first AFR100 member country to publish a national framework for measuring progress on restoration. The World Resources Institute and the USAID-PERFORM (Protecting Ecosystems and Restoring Forests in Malawi) project supported this effort. The new framework focuses on collecting household data to show whether restoration is achieving its intended goals (see the graphic below). For example, if rural Malawians are spending less time on firewood collection, this may indicate an increase in the availability of energy resources such as wood or charcoal due to successful community forest management. Or, if a household is better able to weather climate shocks (such as drought or landslides), it may highlight that restoration practices are improving climate resilience. Practitioners leading restoration programs can use these data to learn from past successes or identify areas in need of additional support. 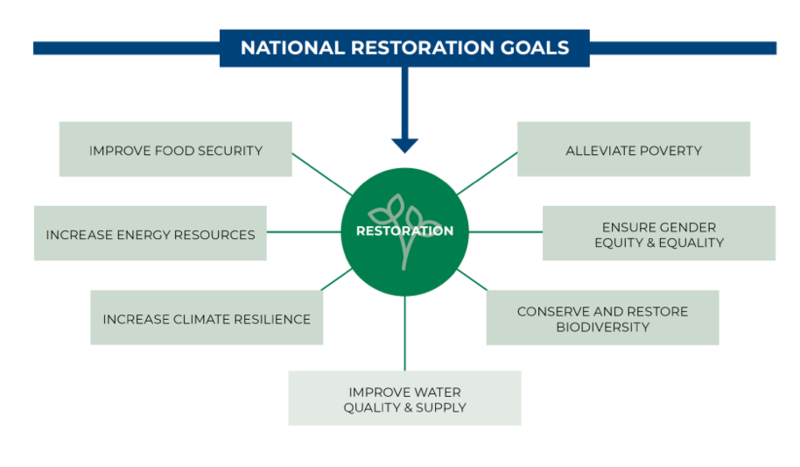 The framework measures whether the restoration programs are helping achieve the country’s seven national restoration goals. Examining the data highlights the importance of measuring progress to understand the impact of restoration programs and to know where more investment is needed. For example, household data collected in 2016 showed that fewer than one in every 10 Malawian households received advice from local extension officers (professionals who work closely with farmers to communicate best practices) on how to better manage their forest and agricultural resources. But of those who received support, only about 64 percent followed the advice for forestry management and 50 percent for agriculture. In both cases, women received advice less often than men, but they were more likely to follow the advice. This revealed a need for further investment in extension services, more research on why people adopt restoration practices and more resources to target women. Bringing important insights like this to the fore through measuring progress is helping to drive successful restoration in Malawi, allowing the government to achieve its national restoration goals. This year, the Malawi Youth Forest Restoration Program plans to restore 50,000 hectares of land (more than 124,000 acres). The youth will plant fruit trees and bamboo and learn how to manage their local forests. And Malawi’s new framework to measure progress will support the government as it looks to increase these types of initiatives and reach its 4.5-million-hectare (11 million acre) restoration goal. Malawi’s investment is looking promising indeed.